In the past three columns, we’ve looked at characters that have enjoyed, largely through their associations, a fair amount of notoriety. In part because of their association with Jack, naturally, and in part because they were woven in the tapestry-turned-juggernaut that is Marvel. One could easily argue that the Wizard doesn’t garner the recognition of, say, Dr. Doom or Darkseid, but he’s certainly had a greater longevity and proclivity than Sky Masters. Sky Masters is one of Jack’s lesser seen creations, due largely to the fact that it hasn’t been reprinted very often and the reprints that have been published are frequently in limited quantities. But it is summarily a beautiful work on several levels, not the least of which is the amazing collaboration of Jack Kirby and Wally Wood. I highly recommend Greg Theakston’s Complete Sky Masters, which reprints the comic strip in its entirety, but if that proves itself to be unavailable, I might also suggest a trip to the local library to browse their old newspaper collections. Well worth examining for anyone with an interest in Jack’s art. Sky Masters of the Space Force was an action/adventure drama which was, although perhaps a bit more dramatic than the real space program, fairly well steeped in contemporary space theory. The “Sky Masters’ Scrap Book” especially appeared every Sunday and provided insights into what was actually being worked on and considered by the U.S. government. The main Sky Masters strip tended to take those ideas and extrapolate stories based on what life might be like should those ideas start bearing fruit. What is particularly interesting about the strip visually, and why we’re focusing on it in this issue’s “Incidental Iconography” is that Jack’s designs seem be based more on fact than in imagination. With many of Jack’s creations, the overall design of a character was based on what Jack thought would make for a powerful visual. A quick look at Mr. Miracle and his Aero Discs is proof enough for that. With Sky Masters, Jack’s work is founded more in reality and his artwork is reflective of that. Look at Sky’s flight suit from few weeks of the strip. It was a slightly simplified capstan partial pressure suit, and seems to most likely be based of the MC-3 model introduced in 1956 (right). The ribbing along the arms and legs is particularly telling. The headpiece is based on the K-1 assembly, a fiberglass helmet often used in conjunction with various versions of the pressure suit in the 1950s. These are both notable departures from “classic” science fiction of the era, where the Buck Rogers unitard and fishbowl helmet were more commonplace. Shortly into the series, however, the space suit design changes. Were Vince Colletta inking the series, I might chalk this up to his tendency to simply Jack’s artwork for the sake of speed, but this was inked by Wally Wood and he was clearly still putting a great deal of effort into the strip. The suit changes to a looser fitting design with less visual ornamentation, and this does indeed seem to be reflective of further research on Jack’s part. The MC-3 series was not, in fact, designed for extended space flights, but more for sub-orbital use. 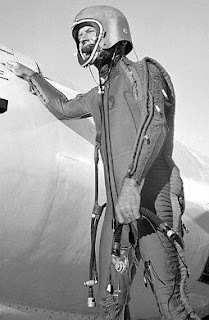 Right around the time the strip began coming out, astronauts were switching to a full pressure suit system that could handle the depths of outer space. Indeed, full pressure suit designs were only first requested by the U.S. Air Force in 1955 and eventually resulted in the MC-2 full pressure suit (left). (Yes, I realize this seems like a counter-intuitive naming convention, and I have yet to find an adequate explanation for it.) The design was refined and modified before the final versions went into production in 1958, one year before Sky Masters. The design is, unfortunately, less powerful. Instead of the form-fitting “action” suit that seems to befit the hero of an adventure strip, we have a bulky, unglamorous bag with no decoration to speak of. It is interesting to note, though, that it is this design that carries through – after a fashion – into Challengers of the Unknown and Fantastic Four. To his credit, though, Jack tightens the suits somewhat for those series, making them essentially a more dynamic version of lycra that most superheroes of the time wore. Of further interest is that Jack maintained some continuity within Sky Masters by keeping the K-1 helmet instead of “upgrading” to the more integrated helmet style seen with MC-2. Curiously, the space suits shown in the Sunday strips (which were actually running a separate storyline from the weekday strip) are of a markedly different design. More interesting is that this design seems to have not been taken from government designs, but from the cover of the then-recently-published Robert A. Heinlein novel, Have Space Suit – Will Travel. The last few Sunday strips revert to the weekday strip suit designs; however, as shown in Complete Sky Masters, this can be attributed to Jack swiping his own, earlier material for sources. Indeed, the last Sunday strip was entirely lifted from previous artwork, including one panel from his attempted Space Busters comic strip. This may suggest that the Sunday strip was more readily lifted from the more fictional Space Busters, and may account for the differences in suit design. A final design change that should be noted is one of practicality. The series’ second multiple-person space flight added the characters’ surnames emblazoned across the tops of their helmets. This was clearly done to distinguish one character from the next, as the space suits themselves had a unifying effect on how the characters looked, something not seen in Sky’s original solo flight storyline. By now, Jack surely realized that his drawings that were appearing in the funny pages were sometimes subject to worse printing conditions than those in comic books. One can see, too, in Wally’s inking a decreasing emphasis on textured details and a greater emphasis on well-placed spotted blacks. A simple and ready solution, of course, presents itself with the large helmet area where character names can be easily and logically written. This was carried throughout the series any time characters could not be distinguished by their facial features.